Way back in late July, Robyn McMaster tagged me in East Koy Four Corners - My Home Town. I was stunned by her descriptions and images and enthralled with the mental picture that Robert Hruzek's meme - called My Home Town - a New Meme - generated [be sure to check out Bob's Home Town, too]. I got a bit side-tracked since then [it's only been 4 months]. Luckily, as Robyn originally tagged me for NYC, and I had the opportunity this week to take fresh pictures, I no longer need to hold back.... And I won't limit myself to NYC! I first experienced New York City during college. During one visit [to a French friend of the family whose cheap apartment in the Bronx I eventually moved into], I remember being awed by the verticality of Fifth avenue. I madly snapped black & white photos of buildings, of parks, or bridges. I love walking the streets of NYC. Everywhere you look, there are delights - from unusual architectural details, to inspiring store window displays, to preposterous neon lights around Times Square... I love how a neighborhood changes character within just a few blocks, and how intensely different one neighborhood is from another. People watching is beyond description. From the Bronx, I moved to Park Slope, Brooklyn, to the very neighborhood where my father was born [the rent increased dramatically, but it was trendier!]. Shortly thereafter, I moved to Fort Lee, New Jersey. New Jersey took some getting used to as I needed a car to get around, unless city bound. Nonetheless, having now lived in New Jersey longer than anywhere else, I have decided that New Jersey and Me are Perfect Together [to paraphrase former governor Tom Kean]. Per the question that Bob asks for this meme: What, in your opinion, is or are the most amazing, unusual, strange or just plain weird things about where you live? Write a post answering the above question, then tag a few folks (choose your own number). Don’t limit yourself to just one thing, either – in fact, the more, the merrier. PLEASE include photos as appropriate (to amaze us all, and, you know, prove you’re not kidding – we all know what a picture is worth, right? ), but remember – the more memorable, the better! + Geneva, Illinois, United States – Brad Shorr at Word Sell, Inc. It's a wonderful world tour that underscores our rich, global and vibrant community! I live in Morris County, just west of New York City, at the foot of the Ramapo Mountains. We have a rich park system, filled with hiking trails and history [the park closest to me used to be a speakeasy]. 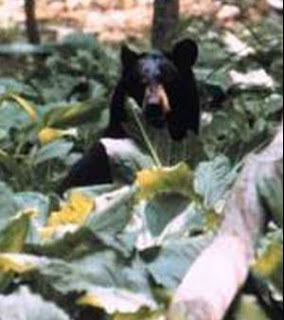 As close as we are to NYC, we are home to the New Jersey Black Bear, which according to the NJ Division of Fish & Wildlife lecture my daughter and I attended last year, is healthier, lives longer and produces more young than the New York or Pennsylvania Black Bear. Go figure! You can learn more by viewing this New Jersey Black Bear slide show. No lions or tigers, although we do have Alpacas, preserved farmlands and Puddingstone. Although I need a car, I have easy access to Newark Liberty International Airport and, of course, to New York City thanks to NJ Transit or the New York WaterWay Ferry. And, the really nice thing about having such easy access to NYC is being able to participate in NYC Blogger Meetup - Night of the Iguana, or -- even more exciting! -- the event of 2008: the Blogger Social '08! Robyn, thanks for being so patient! Any chance you might make it to the Blogger Social? Drew McLellan describes it best in Age of Conversation: Time to play in the big leagues. You may have also read all about it in Age of Conversation Revisited by Anna Farmery or The Age of Conversation Going Amazon by Todd Andrlik or Act Now! Last Chance! by Scott Monty or Age of Conversation makes a great holiday gift by Colin McKay or even The Age of Conversation Goes from Lulu to Amazon by Valeria Maltoni. 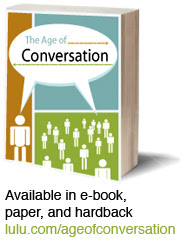 Here's the scoop: you have until November 30th to purchase through Lulu.com the hard cover or paperback version of The Age of Conversation. Starting December 1st, we are joining the big leagues and The Age of Conversation will be available only through Amazon and other book sellers throughout the world. That means at an increased price to cover the book sellers' commissions. So, from that point forward unless you are buying either the hard back or the paperback versions in bulk, neither will be available directly through Lulu.com. The e-book will remain on Lulu.com for the same price of $9.99. With this move, we anticipate raising even more money for Variety! Will you be a part of this great project? With the holidays upon us, you might be looking for some holiday gifts. Look no further! Sacrum, Sean Howard, Tim Jackson, Patrick Schaber, Roberta Rosenberg, Uwe Hook, Tony D. Clark, Todd Andrlik, Toby Bloomberg, Steve Woodruff, Steve Bannister, Steve Roesler, Stanley Johnson, Spike Jones, Nathan Snell, Simon Payn, Ryan Rasmussen, Ron Shevlin, Roger Anderson, Robert Hruzek, Rishi Desai, Phil Gerbyshak, Peter Corbett, Pete Deutschman, Nick Rice, Nick Wright, Michael Morton, Mark Earls, Mark Blair, Mario Vellandi, Lori Magno, Kristin Gorski, Kris Hoet, G.Kofi Annan, Kimberly Dawn Wells, Karl Long, Julie Fleischer, Jordan Behan, John La Grou, Joe Raasch, Jim Kukral, Jessica Hagy, Janet Green, Jamey Shiels, Dr. Graham Hill, Gia Facchini, Geert Desager, Gaurav Mishra, Gary Schoeniger, Gareth Kay, Faris Yakob, Emily Clasper, Ed Cotton, Dustin Jacobsen, Tom Clifford, David Polinchock, David Koopmans, David Brazeal, David Berkowitz, Carolyn Manning, Craig Wilson, Cord Silverstein, Connie Reece, Colin McKay, Chris Newlan, Chris Corrigan, Cedric Giorgi, Brian Reich, Becky Carroll, Arun Rajagopal, Amy Jussel, AJ James, Kim Klaver, Sandy Renshaw, Susan Bird, Ryan Barrett, Troy Worman, CB Whittemore, S. Neil Vineberg. Happy Thanksgiving!! originally uploaded by pinkbirdgirl. Did you know about this micro site on The History Channel's History of Thanksgiving site? It's pack full of fascinating information. My all time favorite Thanksgiving story comes from Art Buchwald as described in Giving Thanks. Even if you are familiar with the story, I urge you to read it as it is filled with Buchwald's amazing humour. Thank you for reading so faithfully, and showing me so much encouragement. I look forward to seeing many of you at the upcoming Blogger Social 2008 and Surfaces 2008 or simply continuing our online interactions. 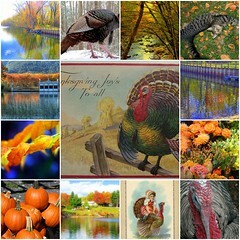 Happy Thanksgiving to you and your families. May your holiday be filled with great humour and cheer, delicious stories and warm interactions. The Grinch originally uploaded by Graubart. It's that time of year again... when something has to be done. No surprise, it came up last year in Elmo Saves Christmas,... But Not From Retailers. This year, with so much added wisdom under my belt, I'm wondering whether to induct unimaginative retailers into David Meerman Scott's Interruption Marketing Hall of Shame. Yes, Thanksgiving is coming right up. It's even early this year. Most consider Thanksgiving the official launch of the Christmas [shopping] season. And, yet, retailers continue to outdo one another to get the process started sooner. Town Center Mall in Kennesaw, GA: not only was it decorated to the max on Thursday, November 8 [including music blaring], but it also had Santa and elves looking bored and desperate for customers. These past weekends, wherever we've gone, we've been assaulted with holiday tunes and red & green decorations. My daughter  has gone up to shopkeepers asking: "Where is your Thanksgiving stuff?" To me, "Momma, why don't stores respect Thanksgiving?" And, since she has blended Veterans Day with Thanksgiving: "We need to say thank you to our Veterans. And the stores are ignoring them!" The prediction is for deep desperate discounts benefiting bargain hunting consumers [see Closeout Racks Overflowing for Holidays by Mark Jewell 11/16/2007]. I actually admire these particular shows of seasonal shopping exuberance. For those consumers wanting to take part, they can. Those who don't [myself included] can simply remain blissfully unaffected. - Christmas music in malls and stores in October and November? That doesn't fly when the kids are busy singing about witches and goblins, Veterans and giving thanks. - Santa and elf photo ops in November? Keep Santa boxed up until after Thanksgiving. - Red, green, tinsel and ornaments in October? Wait until after orange/black and orange/red/brown/black and green have had their moments of glory. By staying out of stores in October, I was able to ignore it. I'm back in stores and I can't run. So, please, give me back my November. Don't overexpose me to Christmas and make kids [and me] gag upon hearing those fake hohohos. I'll delight in them and in you if the season is right. 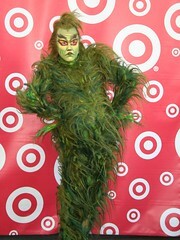 Grinch, steal the fake November's Christmas so we can truly treasure the magic of the real Christmas season! Help retailers remember how to cleverly draw customers in without resorting to unimaginative interruption marketing methods. Public Speaking For Success originally uploaded by wardomatic. At the MarketingProfs Business To Business Forum in Chicago, Ann Handley and I got to talking about public speaking and the tips we've gathered over the years to guarantee success. We had so much fun comparing notes, that it only seemed right to share my top tips here. I bet you, too, have accumulated a fair share of worthy words of wisdom. Would you like to share yours? Link to this post, include them in the comments or send them via email to CBWhittemore [at] gmail [dot] com. I'll gather them all together in one place. 1. Never eat a banana immediately before a speech. For that matter, avoid dairy products, too. Both contribute to a distracting need to clear one's throat during a presentation. 2. Drink lots of water, ideally with lots of lemon [I avoid ice]. Have water with you at the podium. This helps minimize dry mouth. 4. In the few minutes before the presentation, clench and unclench all of the muscles in your body. Do that again and again. It will help dissipate excess energy. Remember to breathe. If you tend to race at the beginning of a presentation, then consciously make plans to slow yourself down and breathe. 5. Practice, practice, practice. Videotape yourself speaking. Practice some more, especially the parts of the presentation when you feel most vulnerable. If it's at the beginning, then learn the beginning by heart. Understand the rhythm of your material. 6. Project your voice and your presence. If you're not sure what that means, then go into an empty church or auditorium and practice projecting both without a microphone. Try singing, too. Fill the entire space with your voice. That will really help things click. 7. Make eye contact, with every part of the room. Hold contact for a few seconds. If you forget, place boldly dressed friends in strategic places and look at them! 8. Do not read your presentation. 9. Do not clutch the podium. If possible, stay as far away from a podium as you can [except for when you need to drink water]. 10. Remember that you are the expert. Express that energy and passion and have fun. You will be contagious. Guaranteed! How might you remodel the Home Depot brand? That's what Home Depot's Chief Marketing Officer, Roger Adams, addressed at the Association of National Advertisers annual meeting in October. According to Adams, Home Depot is the 8th largest employer in the US with 350k associates. Its growth has been fueled by price, selection, and service. The original premise was based on the simple idea of making pro brands available to all without price discrimination. Associates were hired from the trades to bring specific knowledge and experience to customer interactions. Home Depot creates an emotional connection to its brand through the notion of "I did it." It's about giving consumers the confidence to try a project; helping them develop a sense of personal ownership and empowerment because they actually did the project themselves. Experienced associates represent a teaching base to communicate and engage consumers across a rational/emotional continuum that recognizes that the home represents an individual's identity, and the most expensive and expressive badge of color, individual style and personality. Adams says that price is not a key driver for consumers. Rather, it is a matter of how satisfied they are with the fun factor of the store, whether the store is friendly, how knowledgeable associates are and how well organized the store is. The market has changed considerably. From a consumer perspective, female decision makers account for 2/3 of the business. They aren't just looking for decor related items. Rising home ownership means that they want to know how to do and fix things themselves -- learning at their own pace. Through the "Do-It-Herself" workshops, Home Depot has successfully engaged and empowered women. To date, over 200,000 women have participated across the country, and the momentum continues. It has resulted in a huge base of loyal consumers who get the word out. Home Depot does not promote the workshops via mass media. Interestingly, the workshops are online driven, with customers developing topics. The online site offers additional web-based training, podcasts and registration for in-store events. Home Depot has also seen a growth in Hispanic customers. As first time homeowners, they have a high comfort in DIY and require more product information, the right assortment to choose from that is relevant to the hispanic culture. Home Depot engages with them via projects and context and has been successful creating an emotional connection by letting them tell their own story [Adams showed an advertising clip showing a Hispanic family speaking in both Spanish and English]. African Americans are ready for home improvement. Although intimidated by some projects, more women are purchasing homes. They want knowledge more than any other segment. Home Depot engages them with fun know-how. For example, it has successfully connected via Urban radio and Steve Harvey [see Steve Harvey going against the grain. ‘King of Comedy’ brings civility, God, and big ratings, to morning radio] who does a lot of home improvements himself. In one year, Home Depot saw its awareness improve considerably. Online, Steve Harvey offers how-to workshops. In addition to the Steve Harvey celebrity seminars, Home Depot offers Ed Begley, Jr. seminars promoting its "Eco Options" product ideas. These cut across categories, using a classification system similar to Energy Star. Despite the market being down, Home Depot is focusing on the customer again, investing in store labor and paying closer attention to customer service. Master trade specialists are returning, and associates have taken to the "orange juiced associates program". As a result, morale is up, attrition is down, and customer scores are up. Community activities represent a strong part of the Home Depot DNA, according to Adams. The NFL Neighborhood MVP Program, for example, creates a local connection, involving NFL fans, to do good in urban communities. This Advertising Age interview from 10/09/2007 took place right before Roger Adams' presentation took place: Home Depot CMO: We Need to 'Start All Over' Q&A: Roger Adams Wants Retailer to Refocus Efforts on Service, Other Basics by Mya Frazier. I guess we'll have to wait a bit longer for Home Depot to get back on track. I promised in California Wildfires to update you on how the flooring industry has been affected by the Southern California wildfires. First, we confirmed that the Mohawk representative whom we thought had lost his home did not. He was evacuated, but is back. And, from all reports, the stores we work closely with also made it through. Some closed for a few days, but are back in business. Floor Covering Weekly reports SoCal fires: Flooring companies deal with the destruction on 10/29/07 that more than 1,300 houses burned down, including the house of the founders of Pacific Solutions - suppliers of management software for the flooring industry. The situation has radically improved since then, although the Sierra Sun's Firefighters warn of continued wildfire threat in California by Michael R. Blood from 11/06/07 states that "catastrophic wildfires that burned across the state last month and in 2003 were of an intensity that should be witnessed rarely — perhaps once a century, they say. The proximity of those fires has raised fears that furious blazes could become more frequent, threatening lives and property." The result is a state task force to review responses, preparedness, building codes as well as "issues from radio communications to building codes to aircraft used in firefighting..."
These issues of communications got me thinking about Communication in a Crucible: Imagination vs.Image Control During California Fires by Communication Overtones' Kami Huyse. She says that "as communicators we are increasingly faced with the choice to either build new bridges with people or work to deceive them." She develops these thoughts in depth in Communication in a Crucible: Imagination (Red Cross) Vs. Image Control (FEMA) During California Fires. Bruce Nussbaum on 10/24/07 shares a different perspective in Inside The California Fires--A Need For Innovation To Fight Them. He says "There may have been systems in place to alert people of various stages of danger, but I didn't see or hear any. Clearly, precise, constant information over the web and landlines is needed. Information that provided odds of your house being in danger given the various variables, especially wind direction, would be especially valuable." The comments point to innovations with specific links and examples, although the state task force will have plenty to discuss. We have learned lessons since Hurricane Katrina, as Kami describes in her article: crisis communication requires a multitude of ways to reach people with timely information. Although the same can be said anytime a message needs to be communicated, a crisis creates urgency. And urgency demands immediate effectiveness. That's where creativity and preparation come in. As you think about communications in your business, prepare. And then consider how to engage the energy, creativity and enthusiasm of those around you to get the word out. Certainly in bad times, but also during good times. You might be surprised at the range of unusual yet effective social media channels available. Photo courtesy of Greer Leisz, our Wear-Dated Regional Manager for the Central Region, whose cousins both live in Orange county and were affected by the fires. The Santiago fire was within 5 miles of one cousin's home. The other cousin housed family friends who lost their home down near San Diego, yet were able to get their horses safely evacuated. Forrester Research's Peter Kim - who blogs at Being Peter Kim - has created a powerful resource with the M20 list of top client side marketing blogs. He has just published the November list and it's an honor for Flooring The Consumer to be included. Peter has enhanced the M20 list blog by showcasing blogging marketers and highlighting why each blogs. Although each answers the same questions, the paths taken to blogging vary greatly. It's fascinating to read. + Max Kalehoff - AttentionMax. He blogs at AttentionMax about marketing, media, and life. He is VP of Marketing at Nielsen Online. + Valeria Maltoni - Conversation Agent. Her blog, Conversation Agent, discusses "how talk can change our lives." She is Director of Marketing Communications at SunGard Availability Services. + Tamara Gielen - BeRelevant blogs at BeRelevant about email marketing best practices. She is an email marketing manager at eBay in Belgium. + Todd "Turbo" Watson - IBM blogs at IBM about technology and e-business. He is the e-relationship manager at IBM Software Group. + Kris Hoet - 'Cross The Breeze from 'Cross The Breeze blogs about interactive, technology and a host of related topics. He is the EMEA Marketing Manager for Microsoft. + Kevin Dugan - Strategic Public Relations blogs at Strategic Public Relations. He is Director of Marketing Communications at FRCH Design Worldwide. I'm very excited that Flooring The Consumer and C. B. Whittemore from Wear-Dated are the latest additions! You can find us at C.B. Whittemore, Flooring The Consumer. In other news, The Hughes Group publishes a digital newsletter called The Nudge and included a story about Flooring The Consumer in the October 2007 issue. What a wild 2007 Bathroom Blogfest Week! I hope you've had as much fun as we have. Thank you for reading. Thank you for participating. We look forward to seeing you again for the 2008 Bathroom Blogfest. Don't forget the Bathroom Blogfest group site! Continuing with Day 5 [yes, into Day 6] of the Bathroom Blogfest, I have one more entry relating to Bringing The Bathroom Blogfest Home. And that is bringing it into the home. 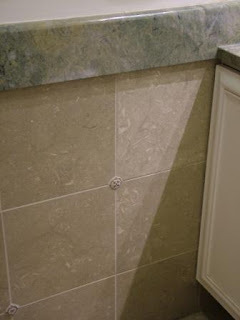 Starting with "The Master Bath Matures. Luxury amenities and calming colors create peaceful and convenient settings in master bath suites" by Maureen Alley from the May 2007 issue of RDB Magazine. It is filled with glamorous bathrooms photos and interesting tidbits [e.g., baths vs. showers]. The section on Functionality reminds me of Bathroom Blogfest Brings It Home to Retail: "The key to designing a truly functional master bathroom starts with finding out what works and doesn’t work in a client’s existing setting. “We need to find out what the key elements are in their minds — what they don’t like about their master baths. Then we need to take away all the negatives and make it a total positive room design,” Trzcinski says. " 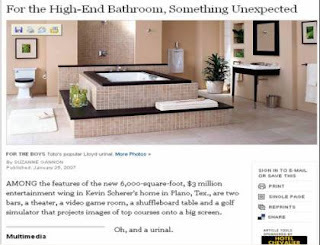 This 01/25/2007 New York Times article by Suzanne Gannon titled For the High-End Bathroom, Something Unexpected examines another aspect of home bathrooms: urinals which are becoming "a definite must for luxury master suites." However, as "there is still a certain amount of squeamishness about home urinals, particularly among women, so marketers are focusing on designer style and claims about cleanliness in an effort to overcome negative associations." Interestingly, urinals even offer environmental benefits... Combine that with hand sculpted artistic statements of style and you get an article definitely worth reading. For design ideas, you might consider visiting Kate Smith [from Sensational Color]'s Room Vues and checking out Bathroom Vues. She reminds us, too, given our need to conserve water to look for the new WaterSense label for toilets from the EPA—very similar to ENERGYSTAR. With that, the 2007 Bathroom Blogfest has truly brought it home! Don't forget to check the Bathroom Blogfest group site. Chandelier in ABC Carpet's 2nd Floor NYC ladiesrooms. Another aspect of Bringing the Bathroom Blogfest Home at Retail is providing advice. This National Floor Trends article from 9/24/07 on The three C’s for your showroom: Clean, Clutter-free and Creative (very creative) by Annette Callari makes wonderful suggestions on how to improve the look, feel and appeal of your flooring retail environment. Annette writes: "Create a space that invites shoppers to explore. Use dramatic lighting and bold colors. Make sure there is a place people can sit comfortably and discuss their options. Eliminate clutter and craft a look that tells the world you are in the fashion business and you take great pride in your showroom. Here's an interesting perspective: "Studies show that few people (maybe 20 percent ) can actually visualize “room-size” from what they see in a small product sample. So when you give them the opportunity to see an entire area decorated in a specific product, this is a huge advantage." Hence the value in putting together vignettes for your customers as well as taking advantage of spaces like bathrooms to showcase new ideas. In her article, Callari includes a picture of a beautiful bathroom vignette to "add a touch of elegance and give your customers ideas." Note the anchor photo for this post. It's of the chandelier from the 2nd floor ladiesrooms in ABC Carpet in NYC. It's absolutely elegant and definitely adds an unusual detail to a bathroom. These next two photo details come from Lewis Carpet One Floor & Home in the Chicago area. Note the attention to different surface treatments and details - from two separate bathrooms. They demonstrate exactly what Ms. Callari describes in her article. However, the best advice in the world is meaningless without feedback and reactions - especially as it relates to bathrooms. Enter Elizabeth Hise, based in St. Louis. She is Channel Relations/Assistant Brand Manager for The Hughes Group and supports me for Wear-Dated and Ultron public relations. I have ever so gradually been exposing her to the blogosphere and am quite proud to have dragged her into the 2007 Bathroom Blogfest! 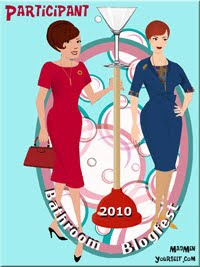 "When I first heard about the Bathroom Blogfest, my immediate reaction was one of relief. Finally someone (or a group of someones, in this case) is paying attention to the importance of bathrooms in public places - especially places of business. Because of the size of my bladder (pea-like), I'm constantly visiting bathrooms everywhere, from restaurants to gas stations to malls. I feel that perhaps, I'm becoming an expert. One of my most recent bathroom experiences took place at Monarch, a delicious (literally and figuratively) restaurant in St. Louis. Exquisite in both ambience and cuisine, Monarch offered a dinner I won't soon forget, and I visited the ladies room hoping that it wouldn't ruin my memories. Thankfully, the ladies room mirrored the restaurant--quiet, serene, bathed in candlelight, and smelling fresh. Later that same week, I traveled an hour and a half outside of St. Louis with my company on our annual Getaway Day. We visited Chaumette Vineyards & Winery, located in St. Genevieve, Missouri. The ladies room was oh-so-spacious, with three separate toilet areas--not stalls, but actual rooms with locking doors. It was like having your own private suite. Clean and well-kept, the ladies room was also odor-free, and delightfully decorated with tasteful floral wallpaper, a full length mirror, and enough room to turn pirouettes. But my favorite ladies room in recent memory was that of Niche, another restaurant in the heart of St. Louis' Soulard neighborhood. An new, upscale restaurant, Niche takes a minimalist approach to decor. It's small, with clean, crisp tablecloths and rows of cozy tables. Not only was the food amazing, but when I excused myself to the restroom, I found a little oasis, just as sleek as the restaurant in which it was located, and complete with REAL towels on which to dry my hands. They rested in a basket next to the sink, with another basket on the floor for used towels. Not only does this this prevent waste, but it makes my hands happy. Thanks to all of those businesses who do bathrooms right!" From Toby Bloomberg: Friday Fun: Which Floor Belongs To Which Loo? October is National Kitchen & Bath Month!